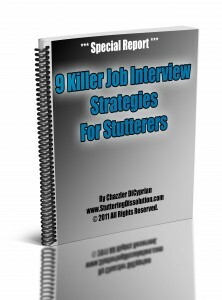 I’ve been getting a lot of questions about job interviews and what to do during a job interview as a person who has a stuttering challenge. Therefore, I decided to write a special report about the topic so everyone can benefit from it. PAY IT FORWARD and share this special report with people who you think can benefit from it. You have my permission to share it on forums, groups, blogs, facebook… simply on anywhere you like to. Help me reach others and contribute to the stuttering community in the best way we can. Vivek has been a part of Stuttering Dissolution for a time now and he agreed to share this video with you. I wanted to share this with everybody because I believe there are a lot to learn from this video. P.S: Feel free to add me on facebook to watch more of those real life videos in the future. Are you interested to learn about the available treatments for stuttering out there? The fact is, there are a lot of alternatives when it comes to stuttering treatments. Once we decide to do something for our speech…what to look for in a stuttering treatment option? which stuttering treatment is the best? and a lot of other questions comes to mind. In this video presentation I am going to provide you an overview of today’s stuttering treatment options with their cons and pros. You need to know these facts BEFORE making your decision.﻿ Hope you enjoy and learn from the video so you can AVOID the mistakes and make the BEST decision for yourself!